As any overly attentive internet followers may be aware, I’ve spent the month of August in residence at Denniston Hill with a hand-picked group of music-types. Here are some pictures of the work that’s gone on here. 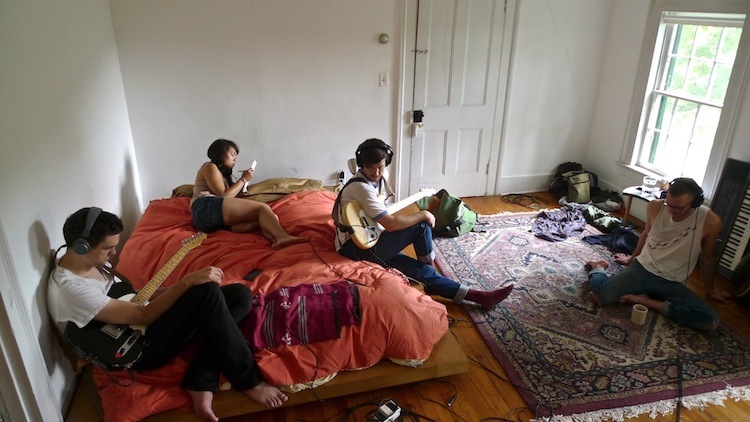 First the most substantive happenings of the indie rock variety, a recording session by Steven Reker’s People Get Ready group which wrapped up last weekend. 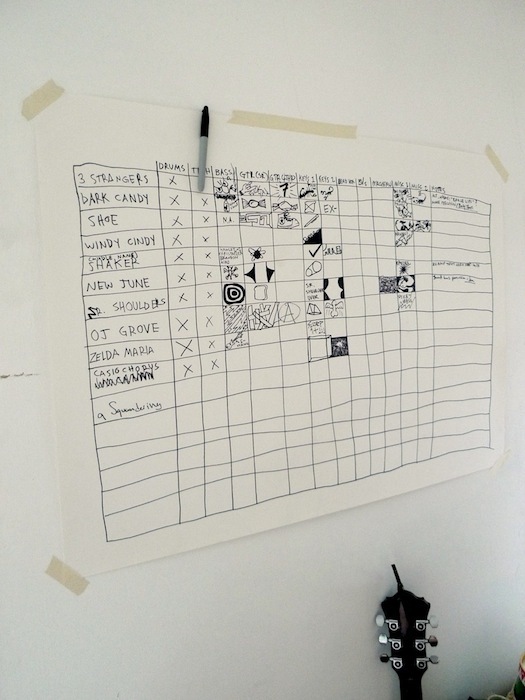 You can still contribute to the Kickstarter campaign funding the session. Please do! 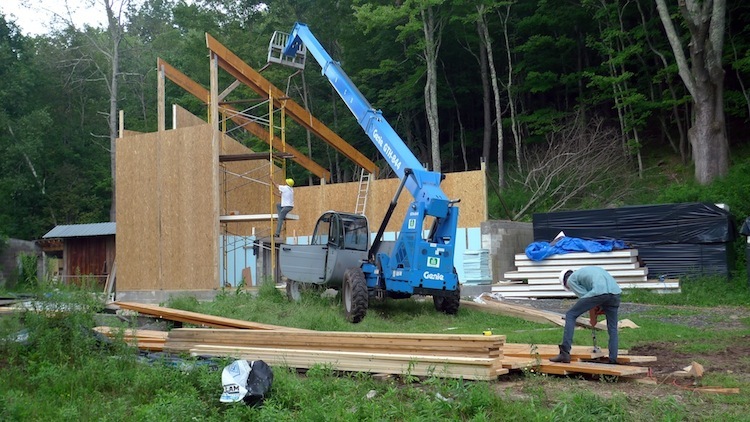 No less ambitious is the construction of the barn on the Denniston Hill grounds which began simultaneously with People Get Ready’s recordings. Site manager John Letourneau and his young charge Levi (sorry, no last name!) have been making nice progress. Earlier today I watched them put the roof on. If there’s one aspect of this place that’s been both most enlightening and most mysterious to me has been the overall relationship between resident & land. Close to the house is a garden that provides a small but steady amount of produce for the residents; next door is a new farm with farm stand sitting out on the street; and, last but not least, in the near distance, just past John’s home, there is a meadow which he has generously donated to a local farmer for this season’s sheep feed. 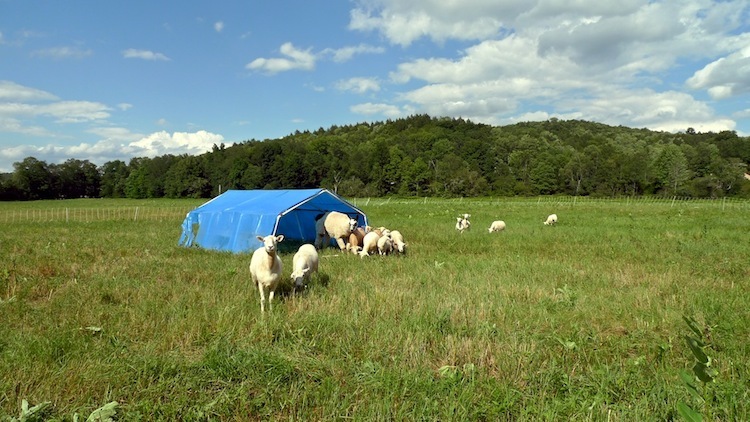 Note the llama coming out of the sheep’s blue tent. He serves as an appropriately nonconformist shepherd. 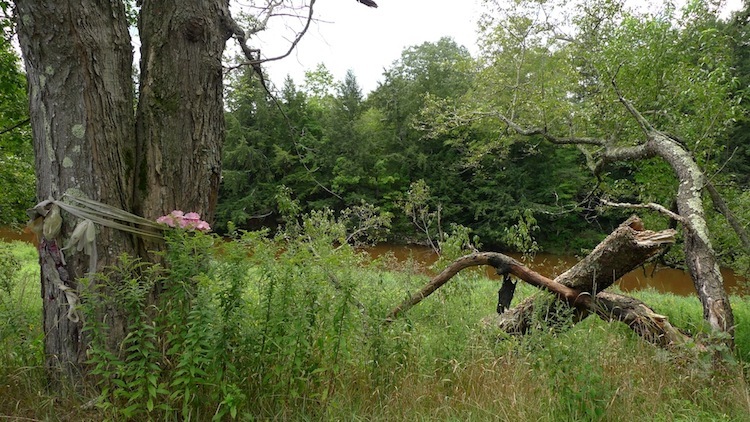 It is not uncommon for artist residencies to be housed in such a bucolic setting. But of the few that I’ve visited, I don’t know if I’ve ever encountered a place where there is a more direct engagement between visiting artists and native setting. Perhaps because of the residency’s small size, it’s intimacy, the discouragement of deep cocooning, contact with nature is unavoidable. Despite the lovely portrait I’m painting of this place, let it be said that it’s not without neighborhood tensions. For example, this particular part of upstate New York, once the the heart of the Borscht Belt, a vacationing hotspot for New York City’s cosmopolitan Jews, has been long abandoned by it’s more reformed visitors. In their place, the region has been overrun by Hasidics & and other more orthodox sects of the faith. This means a certain subliminal…discomfort…between that community and a more liberal variety of New York City escapee. Pictured below is a sign posted by Denniston Hill’s neighbor Mo David North just up the hill — a frequently vandalized sign that says “God Loves Fags” in English & transliterated Hebrew. It’s been visible the entire month I’ve been here but the official opening is September 2nd. Plan your trips! To focus on either the tensions of rural living or the mysteries, however, would be to miss the point. Mostly Denniston Hill has offered a focused opportunity for research & a more abstract kind of peace.